A cute little bag in bright sunny yellow - to cheer the drear, and haul the keys. And the cell phone. And the wallet. Or maybe your lunch? For only a yard of fabric. Sorry - sideways photo. Everyone please lean left. Look how fun - polka dots! Flowers! Rick Rack! A tutorial today, complete with photos AND diagrams. Wow - slick! Both should be cotton fabric, and approx. 40+" wide. Sewing tools - pins, scissors, rotary cutter & mat, thread, etc. One length of large rick rack, color of choice, cut to 20"
Then I got a little more serious, and decided to map it out on graph paper. And I have some really big graph paper! I doodled some more and measured and listed my objectives for this project, like the fabric requirements, and all my other ideas I wanted to incorporate. Then I sketched some more. 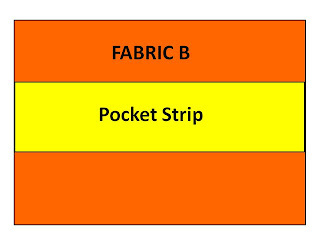 1 piece 18 1/2" x 10 1/2"
Also, 1 strip from Fabric A 4 1/2" x 18 1/2" (feel free to change the 3 1/2" measurements to suit your tastes. You can also cut a piece of Fabric B to a desired size to make an outside pocket (or pockets). There is a 1/4" seam allowance throughout. Not sure where that 1/4" is on your machine? Use your general purpose sewing foot, then use the right edge of the foot as your guide. That's what I use for most things that require 1/4" seams. If you are doing precision piecing on a quilt, where that 1/4" is the difference between a really nice quilt, and a knock-your-socks-off quilt, put both the needle and presser foot down. Then, lift just the presser foot. Line up a small ruler with the needle, and make a guideline on the throat plate with painter's tape at the 1/4" mark. Use the really skinny painter's tape - you may have to buy it at a paint store. Don't worry, it's not that expensive. Finished bag is roughly 6" x 3" x 10". 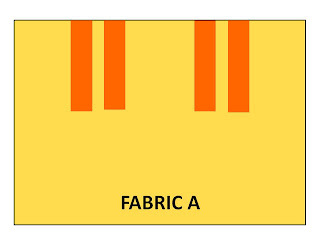 Fabric A is on the bottom here, and Fabric B is on the top. I trimmed them both to 18" to meet the 1/2 yard measurement. Like I said the extra fabric can be used for pockets on this bag or another project, used in a scrappy quilt, etc. 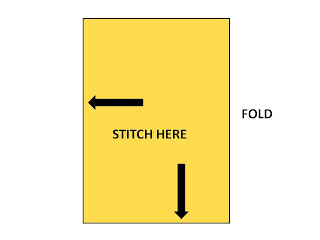 After you cut your pieces, you will press all 4 edges of the pocket piece down 1/4" and straight stitch them into place. Next you will make your straps. With right sides (the printed sides) together, stitch up one long side, across the one short side, then back down the other long side. This makes a great big tube. You will need to turn it right side out. You can do this one of two ways. I used the end of a knitting needle. Separate the layers at the short end, then tuck the head of the knitting needle into the little pocket that this makes. Push the needle and pull the fabric back up over it, until all the fabric is reversed. Then line up your seams as best you can, and press it flat. Put a little tail of the string in between the two pieces of fabric, then drape the long end of the string out the back. Pins here are generally helpful. 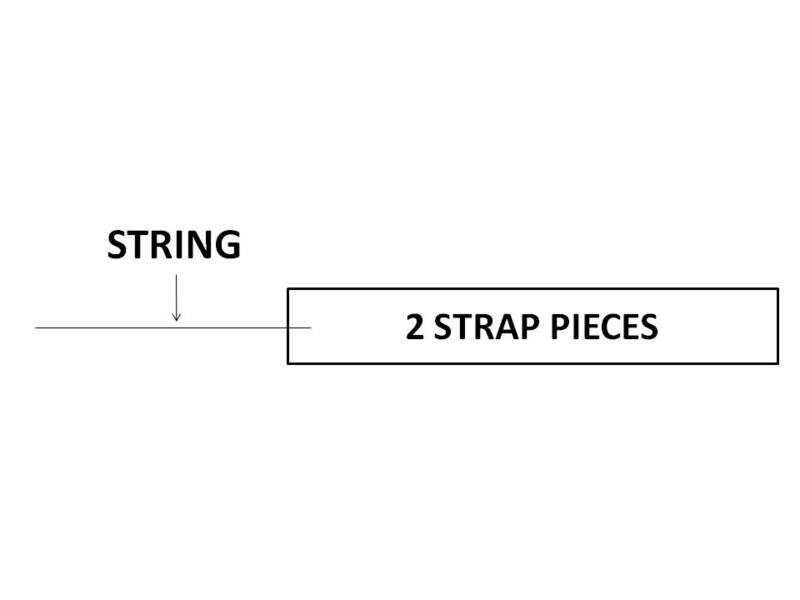 The sewing method is the same - up one long side, across the short end and string, and down the other long side. To turn, pull the string. 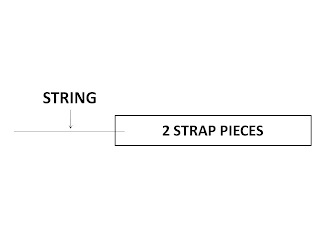 After the strap is turned, simply clip the string as close to the seam as possible without cutting the actual seam. Clipping corners - also good. For this type of project, I will use this method next time. Use whichever way works best for you. Cut the strap into 2 pieces of desired length. My two pieces were about 18" each. Sounds really long, I know, but remember, they will be folded in half when placed on the fabric, and you also will lose another 1/2" in seam allowances. Make your straps longer or shorter. I'm going to try shorter next time. Stitch bottom edge into place to secure. No need for seam allowance here, just topstitch over your previous sewing. More measuring and marking here. We will start from the left side and work our way to the right. The sides of the bag are 3", and we've allowed room for 1/2" in seam allowances. From that left edge, measure 1 3/4" and put a pin in the top edge of the pocket strip. Trust me, it will all work out. This section makes what I'd call pen/pencil pockets (or lipstick pockets if you are so inclined). From that pin, measure 6" and put in another pin. Measure 3" and put in another pin. Measure 6" and put in another pin. Finish up by pinning the last corner of the strip to the main body of your soon-to-be bag. 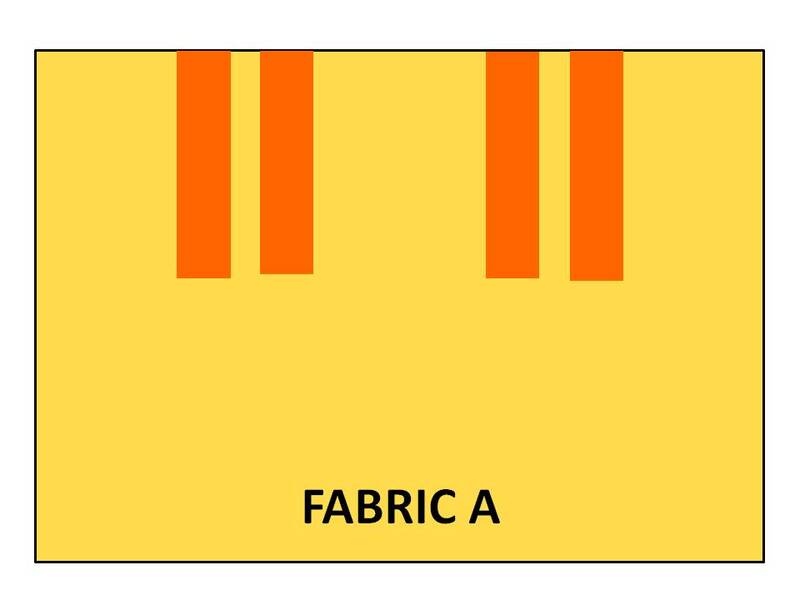 Do the same measuring and marking on the rectangle of Fabric A at the top of the rectangle. You'll see why in a bit. Back to the pockets. I lined up my presser foot with the pin, lowered the foot, then slid the pin out the back. 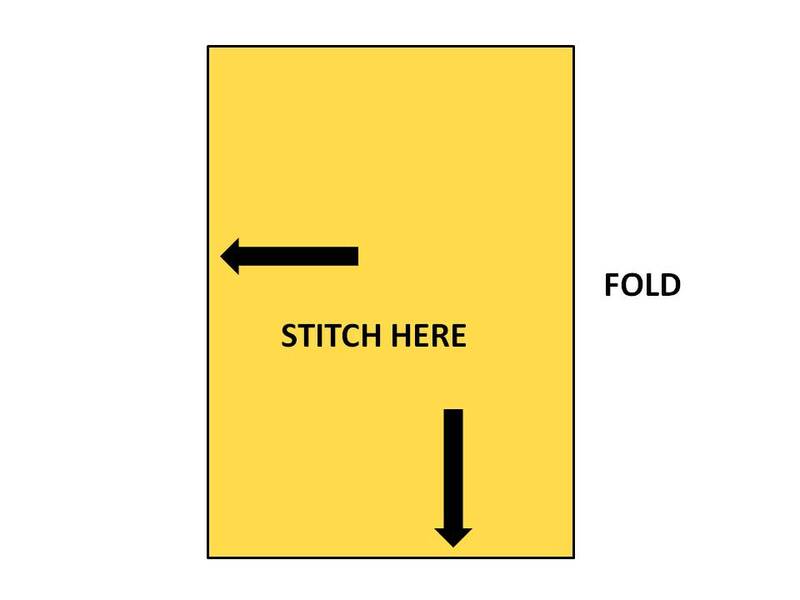 Use a reinforcing stitch (forward a little, back to the beginning, then forward again) at the top and bottom of your seam to ensure your pockets don't rip out the first time you put something in them. Repeat this step for all the pockets. When you are all done, press the top edge of the main piece down 1/4" toward the wrong side (the back). Use your imagination for the looping part. 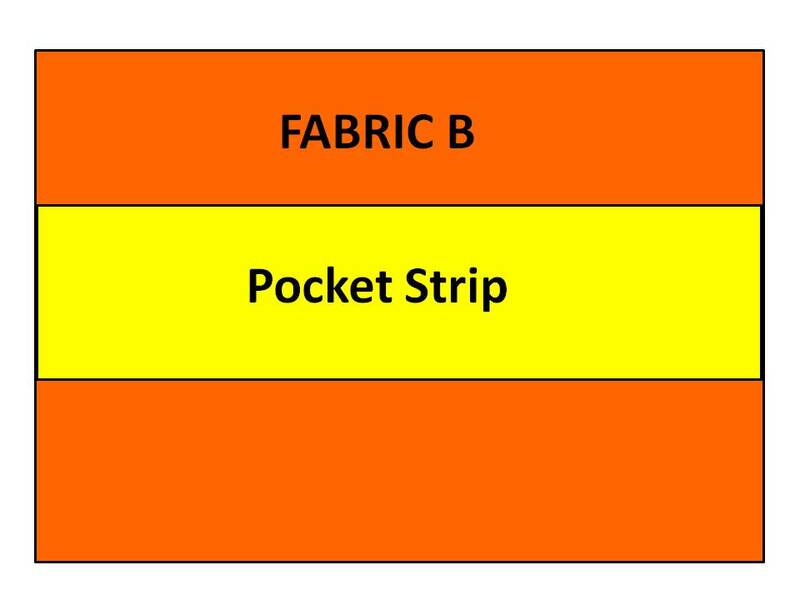 Be sure when you place your strips that the fabric you want to show is on the outside of the loop. If you want your straps to match the outside of the bag, put the Fabric A side out. If you want them to contrast, put Fabric B on the outside. Stitch them into place, and definitely reinforce the stitching. After the straps are stitched in place, press the top edge of the rectangle, strap edges and all, down a 1/4" toward the wrong side (the back). Now we are going to turn these pieces into bags. Fold each rectangle in half with the short edges meeting. Pin if desired. Stitch along the edges marked by the arrows. Do this for both rectangles. Press side seams open as much as possible. Line up your quilt rule with each bottom corner so that you have a 2" square marked. Mark this square (I used a pencil), then cut out. Do the same thing on the other bottom corner. Repeat with the other piece. I add a row of reinforced stitching to the bottom edge, just for security. Then trim the fabric as close to the stitching as possible, without going THROUGH the stitches. Find the inside cut corners of the open squares. Pull the bag open by pinching at these corners. Line up the cut edges and pin. Repeat on the other side. Make sure your center seam faces the same direction. Repeat for the other piece. It's ok if it bunches a little bit. Try to make fabric even. This is called easing. Usually, you do this in a sleeve. Stitch in place, using a 1/4" seam. Be careful to remove your pins as you sew. Let's put this baby together, shall we? Turn the piece with the straps RIGHT SIDE OUT. Leave the other piece with the WRONG SIDE OUT. Insert your lining into your bag, matching the side seams, and pushing out bottom corners to shape as you go. Home stretch! Now we are going to put the rick rack between the layers, and pin everything together. This is the end of the rick rack. Fold the cut edge under about 1/2", so it matches the wave above it. And now, WE PIN! Match this folded edge with the side seam of your bag. The cut-edge-side should be facing the lining. Pin in between the layers of the bag. Continue pinning all the way around, going behind the straps. This is what is will look like when you get all the way around. Carefully stitch all the way around the top edge. I used a decorative cross stitch - not just for looks, but also for reinforcement. I also used a yellow, matching thread. You can use a straight stitch, zigzag, or contrasting thread. Whatever your heart desires. If you want something more stiff and sturdy, you can add stabilizer. Or quilt it with some batting. Make it with a bunch of fat quarters and scraps. Use leftover jelly roll strips for the handles. Make it all one color. Make it without rick rack. Make it from repurposed men's dress shirts or old blue jeans. Use your imagination and your stash, and have fun with it! And PS - if you make one, please leave a comment - I'd love to hear about what you made! WOW, it looks great and awesome tutorial. I'm a total picture person so it makes it look more attainable. Thanks for sharing! Newest follower from the Wednesday hop, would love if you could follow back. This is an AWESOME little bag and a FANTASTIC post! We don't see enough good tutorials like this. THANK YOU!!!! So thorough and helpful. I love it. Thank you for sharing it on The Country Homemaker Hop. Really nice tutorial! I love the colors. Cute bag. Saw you at Whatever Wednesday. Hope you will stop by suppersyoungansthangs.blogspot.com. I noticed in your profile we have a lot of the same interst. Sign me up for your newest follower.